Building a home is one of the most exciting milestones you can accomplish in a lifetime. It’s a wonderful experience – when it all goes to plan! As with any large-scale project, mistakes can be hard to avoid. If you carefully dodge the big ones (those difficult mistakes that lead to unexpected costs and disappointment) you’ll be right on track to building your happily-ever-after home. In today’s blog, the Aston Homes team highlight three main issues to be aware of when building your dream home. Many builders call these ‘unavoidables’ but in true Aston Homes style, we’re here to offer you some expert insight. Unfortunately, these costs may be the biggest unexpected expense you encounter on your building journey. Site costs will vary from location to location and are therefore difficult to put a definitive price on. Your builder will need to price for soil tests and contour surveys, in addition to considering the costs of connecting and maintaining utilities such as water, electricity, gas, sewerage and fire control. 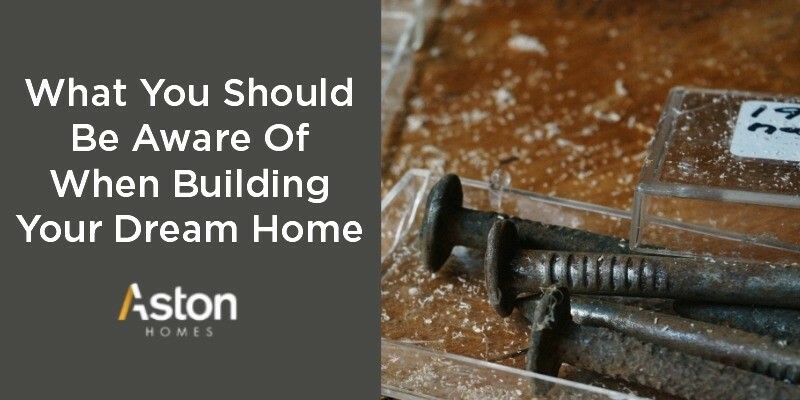 There is not a great deal you can do to avoid these preliminary site set-up costs, but it is wise to clarify with your builder what is included and what is out of contract. At Aston Homes, we’re more than happy to discuss these elements with you from the get-go. When your hard-earned cash is involved, we’re all about transparency and being upfront with our clients! When it comes to building in Victoria, permits rule all! The Building Act 1993 and Building Regulations 2018 legislate that all building work is subject to the issuing of a building permit – and acquiring this permit can take some time. Though somewhat tedious, you will discover that these documents, which are prescribed by Victorian building legislation, are designed to protect you. Swiftly and professionally, a quality builder will ensure that all the necessary boxes are ticked compliance-wise, so to avoid unpleasant bumps in the road further down the track. You may be excited to get started on your dream home, but this is one building ‘unavoidable’ you don’t want to rush through! A third potential ‘bump’ in the road when building can come in the form of a home’s finishing touches. Courtesy of our many years in the building industry, the Aston Homes team have observed many buyers disappointed to learn that the gorgeous finishes they admired on their display suite visits are not part of the advertised price. Many builders will charge the earth for these extras and variations, but that’s not the Aston Homes way! At Aston Homes we’re focused on building quality, modern homes with all the trimmings for Australian families. #TheirExtrasAreOurStandards! Now that you know what to keep an eye out for, it’s time to begin decision-making! Our team are happy to chat through any concerns you may have about these pesky concerns. Contact us here.